Today I just made another small module for Sitecore content editor from where user can export sitecore item and its children as package directly without going to Package Designer. Off course this is not package designer replacement, but it is developed by keeping in mind that mostly content editor or developers needs to move small content from one environment to another very frequently e.g. dev to staging OR staging to live. 1. Download Sitecore module from marketplace or Github. 2. 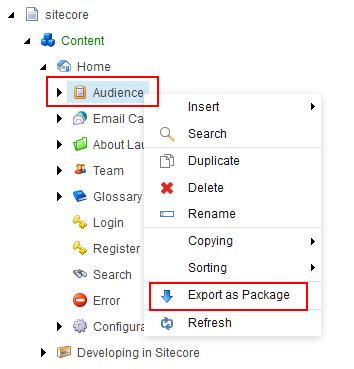 Install using sitecore install package wizard. Thanks for reading and using module. First experience with Sitecore 8 using SOLR ? Today I want to share my first experience with Sitecore 8 using SOLR. I’m fan of Lucene and have implemented complex search architecture so far. However I wanted to play with SOLR as I heard about its benefits like e.g. if loads of content then SOLR is better , if you access index over HTTPS then SOLR and bla bla bla but not clearly documented anywhere. Recently Sitecore posted very useful articles which will helps you in clear your queries and helps you to decide weather you should use Lucene or SOLR base on your requirement. After reading above articles I got clear picture of both tools and its capabilities, then I read many blogs on implementing SOLR locally and found almost everyone has different experience and challanges of installation and implementation as SOLR and Sitecore 7.x and 8.X has changed their config and API as part of evolution and improvement. I followed below blogs to setup SOLR(5.2.1) locally with my existing Sitecore 8 (update 3) successfully. Good for understanding as they target 7.X and older SOLR version. Below one I used and succeed. I follow below link to implement SwitchOnRebuildSolrSearchIndex so that my environment will not get downtime while index rebuilding. I face below errors while implementing SwitchOnRebuildSolrSearchIndex . Node, String parameters, Boolean assert)). er.SwitchOnRebuildSolrSearchIndex.No matching constructor was found. Comment out below line, as class SwitchOnRebuildSolrSearchIndex only take 4 parameters. Thanks for reading, I hope post has help you to understand and setup your environment. My experience was good as many people has posted their hard work. I keep sharing my update on SOLR and Sitecore. Sitecore 8 is getting popular day by day due to its new power and capabilities, also customers are showing willingness to create/migrate their website on this powerful platform. With this new solution, it also brings different infrastructure requirement which really makes it powerful. Being a Sitecore lover and Solution Architect I keep reading lots of blogs and articles to brush up my skills and knowledge. I was amazed by knowing Sitecore 8 scalability options available like On-Premise, Hybrid and xDB Cloud. Sam: Hey Mrunal we have new client and have to propose infrastructure requirement. Me: That’s great… ! Which version they want to implement? MongoDB Session Server (Optional) can be SQL instance or In proc(not recommended for production). Windows Server 2012 R2 – recommended for most Sitecore instances, especially processing/aggregation servers. MongoDB 2.6.1 or later for the collection database, session storage and tracking databases. Install MongoDB on Microsoft Windows Server as a Windows service. Microsoft SQL Server 2008 R2 SP1 or higher for the reporting database. 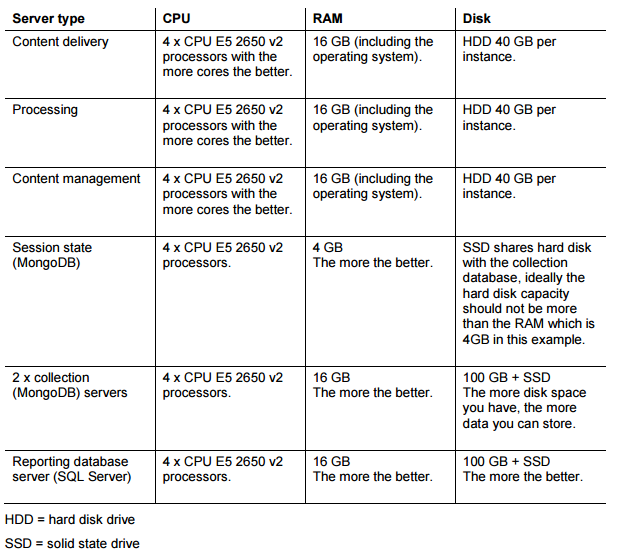 The above setup/requirement totally makes sense as its purpose is to scale(horizontally and vertically) and distribute processing power between different servers to achieve the best result for enterprise application. Me: Hey Sam, there are multiple ways to implement and host Sitecore 8, who will take decision which approach we are using like on-premises, hybrid or xDB one? Sam: It’s totally depends on client. Me: Can I have their license details please? Sam: They have 3 Sitecore licences, 1 for Staging/UAT, 1 for CM and 1 for CD. Me: What about xDB option? Sam: I believe it will be on-premises. Me: What about MongoDB servers and replication set? 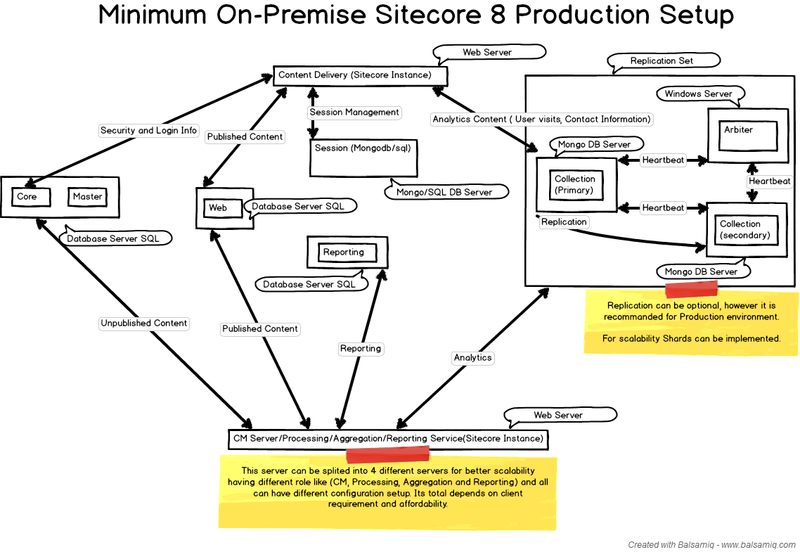 Sam: Try to put best minimum On-premise Sitecore 8 setup with recommendations. Me: Great… this information will help me to design infrastructure diagram. I believe above brain storming helps you to design your solution. Keep an eye on this space where I’m going to publish how to implement above setup practically 🙂 In two versions, one for developer and one for production. Kindly post your suggestion or idea to make this better. Recently one of our project require schedule agent to generate order status report for past 1,3,5,7 days (can add more in feature).As part our solution design we (I and Sam, another developer) start discussing solution so that we both remain on same page. Sam: We need to create four schedule agents in config file with parameter Day: 1,3,5,7 and so on. I: But they might have more agents in future with more number of days or they might want to disable some. Sam: But config is only way where you can specify parameters and they get mapped to property automatically or we need to extend schedule task template by adding custom properties and can be read out from code. However it may possible other Schedule task don’t want these fields (functionality specific)? I: Let’s add single parameter field in task template and bind parameter to properties dynamically. Sam: That would be cool! How? I: Here is code and solution which we will use now on words for such requirement. Sam: Wait wait but what about schedule job must run in given time frame and must execute once per day only ? I: Brain has already provide solution on his blog which is really good solution and fulfills our requirement, just find code below which will include all requirement and you just have to write business logic. I believe both approaches has pros and cons, but if we get more flexibility by doing small change then I always prefer to do trade off. – Requires IIS restarts to change. I hope you like our conversation and might help you understand real essence of solution. If you have any feedback I would like to hear. How do I hide the “publish subitems” option in the publish dialog. Recently in Sitecore Forum, Joseph asked “How do I hide the “publish subitems” in the publish dialog.” I already knew solution steps but just google to find any ready made post available if any then post in reply. I found few but not to the point so I replied with steps exactly Joseph required and he was able to achieve his task and found him encouraged. Thus thought lets put in public so other developers have benefit too. 1. Copy Publish.xml file from “sitecore\shell\Applications\Dialogs\Publish” folder to “sitecore\shell\override” folder, so that you don’t messed up original file in case if you want to revert back your changes, just delete newly copied file. 3. Add Visible=”false” attribute to border control like below: e.g. Generally in Sitecore foundry every website will share single WFFM’s webform folder. However if you have multiple clients on same foundry instance then each client will have different webforms for their site. Its good to have separate webform folder for each client so no other client can access webform and its data of other client. Also when we want to generate Sitemap.xml file for each website using sitecore task we need each website scheme i.e. “http” or “https” so that you can create site specific Url. Below solution will help to achieve above goal. //Traverse Site root children for Local WFFM's webform folder. Today I received new requirement from client, they want their media Urls to be SEO friendly, thus media urls will have no ‘ ‘ it should be replaced with ‘-‘. Sitecore manages page url very well, however media url requires custom development. To achieve result, we need to overwrite Media Provider. Any item has “–” in their name will not be served by Sitecore as it creates ambiguity between name. I have tested this solution on Sitecore.NET 7.0 (rev. 140120). I always like tools/frameworks/library which are easy to use ,flexible enough and ready to adapt feature technology to provide customization if required.Our project based on Sitecore CMS was growing day by day due to every day development and thus I realize that there are so many java scripts and Css are being written, as a result page size, number of request and server load increases which again results in low performance. To find solution I started doing little bit research on availability of tools and framework, I followed below link written by SCOTT HANSELMAN here. I tried many tools suggested by link and choose “Combres” based on benefits it provides. As Sitecore intercepts each of request comes in if unable to find then it throws/redirects to 404 error page. By doing this Sitecore will just ignore all request of Combres and thus Combres handler can work smoothly. Let me know if this helps in your development and optimization process. Sitecore Conditional Rendering based on Host name. Single website should behave as two different website, and show or hide rendering conditionally based on host name. It’s a small solution but can prove very useful. How to keep Alive your Sitecore instance 24X7? I was working on one project which has critical jobs running on content authoring server which must run during mid-night every day and import required external data, store in Sitecore and publish automatically, but due to few reasons it was not happening. Below are those reasons which I discovered. You will only receive this error if URL specified in config is not full absolute URL, for more information you can refer John West blog here. After implementing this solution and still we had an issue like Sitecore is shutting down. Although URL agent was running now, Sitecore was shutting down and if once Sitecore is shutdown URL agent will not going to work until someone hits Sitecore URL again. a. Memory Increase: Sitecore can shut down if memory available memory is not sufficient and worker process may crash. Once can add more memory to solve this issue or do code refactoring for other memory issues. b. IIS recycle: There are many reasons due to which IIS recycles or Sitecore instance shutdowns. Most of cases you cannot avoid recycling as its nature of IIS. Even we try to increase Ideal timeout in IIS as user activity on content authoring server is very less, but no luck. Sitecore instance should keep running even if it shut down for any reason and should execute jobs on time. I implemented windows schedule task which executes every day with duration of 10 minutes (thanks Alexander Sharamok, a Sitecore support guy for suggesting 10 minutes). This schedule task responsible for executing our BAT file, which in turns pings Sitecore keep Alive URL. Thus I’m keeping Sitecore running from outside :). Once Sitecore is running it will execute all your jobs on time. Goal achieved.